Ukraine will pay Gazprom $2 billion for gas it has received from Russia by the end of October and an additional $1.1 billion by year’s end, EU Energy Commissioner Gunther Oettinger announced. The amount that Ukraine is expected to pay Russia is short of the $5.3 billion that Kiev currently owes Gazprom. Gazprom will resume gas deliveries and send at least 5 billion cubic meters (bcm) of gas to Ukraine at a price of $385 per 1,000 cubic meters after it receives the first tranche of $2 billion, the EU commissioner and Russia’s Energy Minister Alexandre Novak said. “This depends on final agreements. Our colleagues say that this is [going to be in] October,”Novak said in Berlin on Friday. However, Novak reiterated that $385 was a reduced price, “$100 discount off the current price” . This price will be valid for another six months, he added. Ukraine will also have the option to buy up to another 5 bcm by the end of March 2015, dependent on weather conditions, Oettinger added. Five billion cubic meters is exactly the additional volume experts believe Ukraine would need to get through the winter months. Currently, Kiev only has 15.5 billion cubic meters of natural gas in storage. Oettinger also said that Russia and Ukraine were aiming to reach an agreement covering gas supplies up to the end of March 2015. A new round of negotiations is scheduled for the end of next week. The EU and the World Bank could act as guarantors of Ukraine’s debt payment, Russian Energy Minister Aleksandr Novak said. Meanwhile, the current gas situation is not helping millions of people in Kiev, who are bracing themselves for a tough winter. With temperatures plunging below zero, without hot water and heat their apartments will be unbearably cold. “We are strengthening the doors and windows to help save heat – but how’s that going to help if it becomes really cold?” an old woman from Kiev told RT. Kiev authorities have already turned off hot water throughout the city in an attempt to save gas for the winter months. “We have a kid and it’s already difficult enough without hot water – we have to boil it ourselves using gas or electricity. In case of more disruptions – I don’t know what we’ll do,” said Alla, a young mother. The Kiev city administration is reportedly considering three future possibilities: a complete shutdown, supplying hot water at lower temperature, or switching to a scheduled hot water supply. People are now rushing out to buy electric-powered boilers for their energy needs. “We never planned to buy a boiler but now I’m forced to borrow money from my relatives to afford one,” a local woman said. But despite the inconvenience people are bearing with utility bills doubling. The Ukrainian gas distribution company Naftogaz warned that gas prices may quadruple by the end of the year as the company plans to set a unified price for all consumers. 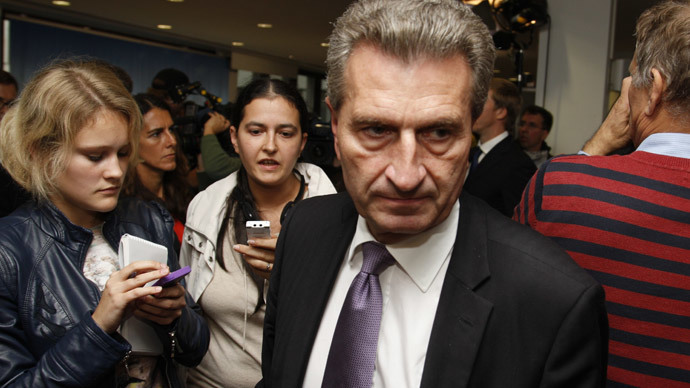 Speaking after three-way negotiations between Russia, Ukraine and the EU in Berlin, Oettinger said the issue of reverse gas flows to Ukraine had not been discussed, Oettinger said. 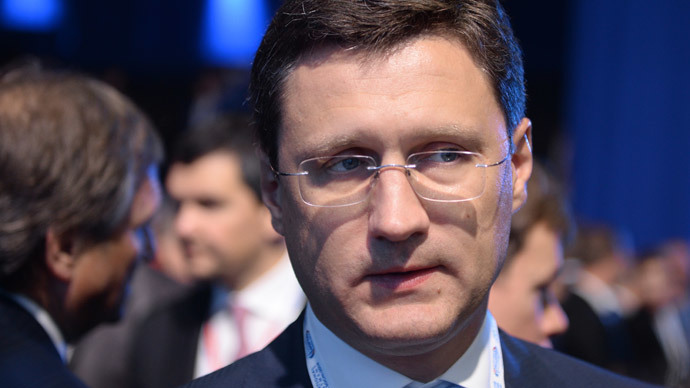 On the evening before gas talks, Russian Energy Minister Aleksandr Novak warned that that supplies to Europe would be threatened if customersre-exportedany Russian gas. “We know that Gazprom has never welcomed reverse supply, because it is unrealistic in terms of overall legitimacy and abnormal in terms of gas business,” Aleksandr Pasechnik, head of research at the National Energy Security Foundation, told RT. The statements were made during another round of gas talks in Berlin held by Russia, the EU and Ukraine on Friday. Earlier rounds of EU-brokered gas talks between April and mid-June failed to produce results. Gas price for Ukraine has been a stumbling block, as Kiev still insists it is too high. Russia has offered Ukraine a final price of $385 per 1,000 cubic meters, a price lower than it sells to any other European customer. In June, Gazprom switched Ukraine to a prepayment system after Kiev refused to pay its billion dollar debt or agree to price negotiations. Russian gas still flows through Ukraine to Europe, but Kiev cannot take off any gas they don’t pay for up front. Ukraine’s debt to Gazprom has been accruing over the year. After Crimea rejoined Russia in March, the Russian gas giant canceled Kiev’s discount, and the price skyrocketed from $268.50 per 1,000 cubic meters to $485 per 1,000 cubic meters, a nearly 80 percent increase in price.